SHOCKING - Lab Test Reveals Less Than 32mg Sterols! This one was a shocker for me. I used to take several different Irwin Naturals products daily thinking they were a solid reputable company. But their laboratory analysis score was terrible. A bottle sells for between $35 - $39.95. There are only 22 dosages in the bottle, so that’s enough for three weeks and a day. You are supposed to take 4 capsules per day. Lets look at what they claim to have in the product on their bottle label. 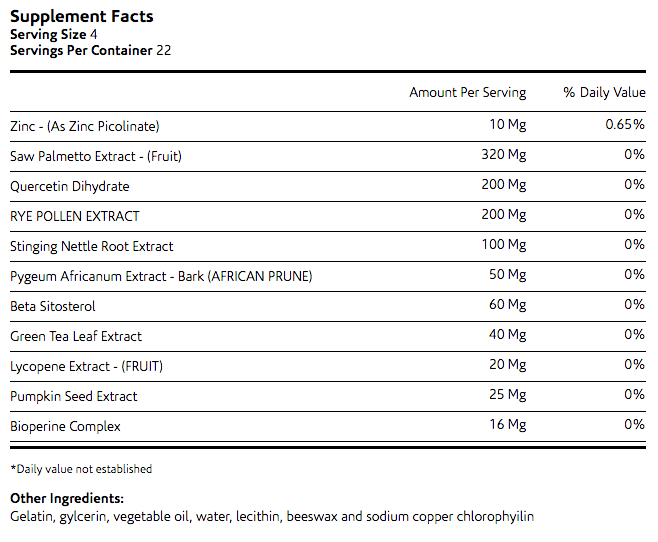 It claims they have 320mg of Saw Palmetto extract. Wrong. That is not what the lab analysis revealed. They claim to have 60mg of Beta-Sitosterol and 50mg of Pygeum extract. So with all of these ingredients how do they explain the low sterols score of 31.8mg. This is a disgrace. Irwin Naturals is owned and operated by Klee Irwin who many of you may remember for his highly successful 30-minute TV infomercial for the colon cleanser called Dual Action Cleanse. I know Dual Action Cleanse was very popular, but this prostate supplement is a huge disappointment. You see it at top stores around the country with its distinctive Green label. Bad score.